I ran into these and thought I’d share a few good ones. Figure self-published authors need some laughs and smiles in the summer. Apparently this is IT for fantasy author memes. Everything else was Twilight for some reason. This entry was posted in Uncategorized and tagged authors, fun, humor, memes, writers. Bookmark the permalink. I love these. Really funny. I play the pinball game when I can get it to load. Solitaire is the back-up. Not my favorite arcade game. I miss whatever you would call the games like X-Men, Simpsons, and Turtles in Time. I had those for my Atari. Loved Dig Dug and Frogger, but Asteroids were my favorite. It’s amazing how far video games have come since my childhood. I had a pong machine too. The funny thing is that some kids that I’ve mentioned it to are amazed and envious because they want to play it. Something about vintage appeals to some kids. I think there’s always a retro thing going on. We only notice when our own stuff gets picked up by the youngsters. As a child of the 90’s, I cringe at some of the revivals. New Kids on the Block? Why? I found all of them in a Yahoo! Image search. 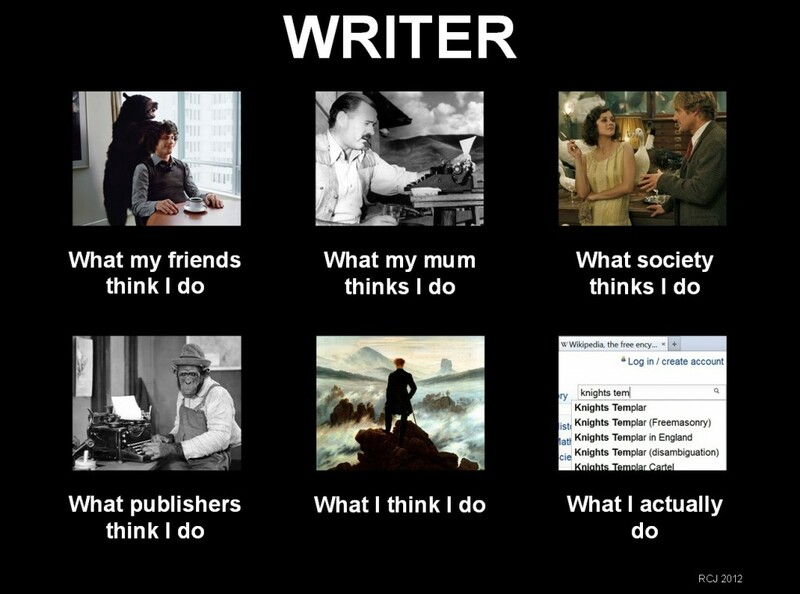 Author meme or Writer meme. There is the research of monsters, weapons, armor, and various other aspects of world-building too. At least if you want to go deep on the building. You’re welcome. There’s a lot more out there. Though, they get a little repetitive. You’ve picked up the essence though! I’m getting ready to reblog you Charles! Thanks for a great post! You’re welcome. Always happy to bring smiles. Sorry meant with (without the “e”)! 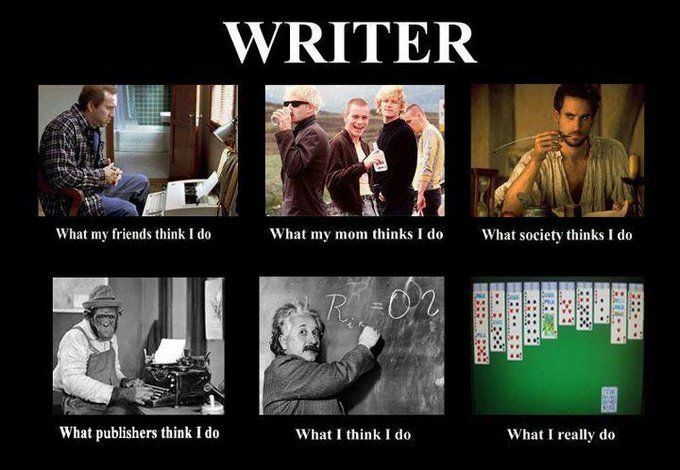 A great post for every writer to enjoy! Thank you Charles! Everyone thinks that about me. If they only knew I spend all my time staring at my blog. Thanks. Hope I continue to impress and amuse. Definitely. I know a few chimp on a typewriter types. They aren’t published though. I am a fan of angry birds in between reading and writing…and 50% of the time I am researching marketing and trying to decide what is worth what….That’s why i love my iPad, I can pretend to be writing, searching the web, reading or whatever when I’m really playing angry birds star wars…..Every time something new comes out I have to beat it. I stopped playing games a while back. Though, I have a new laptop on the way, so who knows what will happen. Felt lazy today and Charles made me laugh! You’re welcome. Needed a laugh myself. They certainly are. Need to find more. How did I miss this. Oh yes, I was at the store. I am indeed. Hear me? Yeah. I was too lazy to backspace. I deserve whatever I get. That’s why I like hammocks. I only have one tree, but they make hammocks that come with a stand. Yes, but that’s for something completely different. It’s really hard to fish off the roof when you’re nowhere near water. You get odd looks. I might catch a pigeon. Aiming for a robin. They’re tasty. those are good in fried rice. Love these! What a great collection I may need to put some of these on my office walls, lol! Thanks. There’s a lot out there too. Happens far too often. I’m noticing it happens a lot when I write dialogue scenes lately. Lol! Love the pictures! Thanks for the laugh Charles!